The best things in life are often simple, affordable, and even free. The same thing can be said for having a better checkout and store visit experience. It’s often the simple conveniences that your shoppers appreciate most. With that in mind, here are seven practical technology functions that grocery retailers can quickly deploy from their technology platform, each of which is either free or very affordable. Faster EMV transactions can help local and regional grocers easily differentiate from national big box competitors, most of whom have poorly developed EMV capability. ECRS has documented some of the largest national grocers taking up to 16 seconds for EMV authorization, and nearly all of them take over 10 seconds. Consumers have grown to hate this new payment process, which is where the opportunity lies in deploying superfast EMV. For example, CATAPULT Transaction Server enables grocers to process EMV transactions in around 4 seconds, sometimes less. This is not referring to Quick Chip for EMV either, but instead faster code execution and form sequencing. Having a direct integration between your point of sale provider and your credit card processor also helps. When your customers first experience blazing-fast EMV, it will be a pleasant surprise for them. Consumers who have been so conditioned to expect slow EMV processing sometimes think something is wrong when they’re actually first exposed to fast EMV. Of course, nothing’s wrong with the EMV transaction – they’re just shopping with a retailer who is using better, more modern POS technology. This is really low-hanging fruit, yet rarely picked: allow your consumers to opt-in and receive their receipts by email and opt-out of printed receipts. Most consumers dislike printed receipts; they’re a hassle to deal with and just create clutter. We’ve all long moved away from paper in nearly every aspect of our lives, so why do we need paper grocery receipts? Why not deliver the receipt in an email? And while you’re at it, do so in a way where the customers’ privacy is always protected, as well as your own business data. This means not using an expensive 3rd party to perform this very simple function. Your POS system should allow for secure and direct e-receipt deliveries, at no additional cost or service fees, right out of the box. Magic happens when you allow your customers to associate with a transaction AND pay using biometrics. In this case, you can use a simple fingerprint reading device. We call it Secure OneTouch™ – an effortless and secure way for your customers to receive all of their rewards, e-coupons, and pay by touching the device one time. Emotion matters, and there is no doubt that Secure OneTouch biometric payment processing will allow retailers to have a closer, more emotional attachment to their customers. 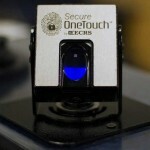 For a glimpse of Secure OneTouch in action, check out this use-case video. You think your customer would never go for self-checkout, but the fact is, they will. Many consumers prefer self-checkout, especially millennials and those who want to quickly get in and out of the store, without talking to anyone. 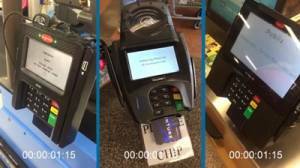 Good news: self-checkout is no longer difficult and expensive to deploy. For example, a modern self-checkout unit can be a fraction of the cost of deploying a manned POS lane or even a legacy self checkout lane. 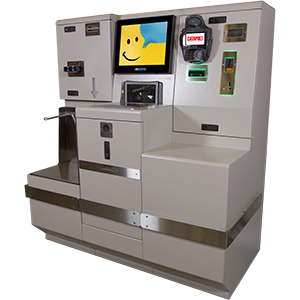 When done right, self-checkout is plug-and-play, with no costly customizations needed. It is now nearly completely autonomous, requiring little to no attendant supervision. This becomes even more important as hourly wages continue to climb. 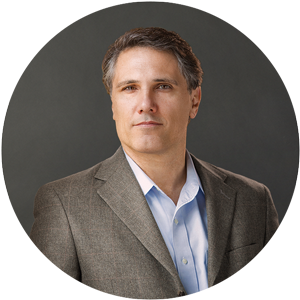 ECRS designed many features, some of which are patented or pending patent, that make these devices as close to autonomous as possible – greatly enhancing the consumer checkout experience, while also reducing store operational costs. It’s time to give grocery self-checkout machines a second look, and perhaps discover and deploy a new tool your competitors have either ignored or executed poorly. The fun part is knowing you paid a lot less money than they did, while your customers receive a better, autonomous self-checkout experience. It feels good to give, even when it’s just a small amount. The idea behind this is simple: during each transaction, your customers can choose to have their transaction total rounded up to the next whole dollar, with the proceeds going to a selected local charity. Though it’s just a small amount, it all adds up to a substantial sum. Totals raised can then be publicized to each shopper, right at the checkout, which generates an even greater sense of goodwill, tieing your store locations and community closer together. 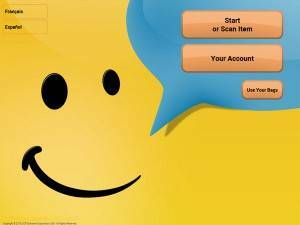 By using this point of sale and self-checkout function, you can position your company as a trusted and convenient way for your customers to give to local causes, and feel good about buying from you in the process. If you’ve ever used Amazon’s “1-Click” ordering than you’re already familiar with tokenization. But this technology isn’t exclusive to online retailers. As with the Secure OneTouch feature, tokenization means using your technology platform to store a “token,” provided by your credit card processors, which links to your customer’s credit card. Tokens are at the very heart of making credit transactions dramatically more secure and reducing the hassle of transacting. 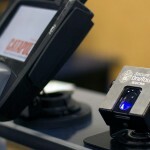 Offer biometric payments (see idea #2, Secure OneTouch). Make returns to the same credit card used to purchase the items. Provide an Amazon-like experience when your customers order online. Enable speedy transactions during click and collect order pickups. 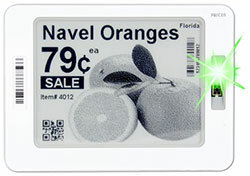 Electronic shelf labels (ESLs) have been widely acclaimed across European grocery stores for years now, but American grocers have not been so quick to adopt this customer-facing technology. Why is that, when ESLs can provide grocers with time savings and improve profits while delivering a modern, digital experience to the consumer? One reason for the slow adoption rates may be the perception of ESLs being too expensive to deploy at each shelf location. This represents an “all or nothing” approach, which is ineffective. Start with ESLs by first deploying them on selected items – those that have the most price changes. It is recommended to start with an ESL adoption in your produce or meat department since pricing and availability for these items are susceptible to changes that happen weekly, if not daily. ESLs offer time and labor savings by eliminating the need for constant re-labeling and new signage in these high-change areas. With ESLs you can also drive down waste by easily adjusting pricing based on ripeness or expiration date. Your store personnel will love it because their workload will be reduced. Your customers will love it too, enhancing their overall experience and how they perceive your digital capability. 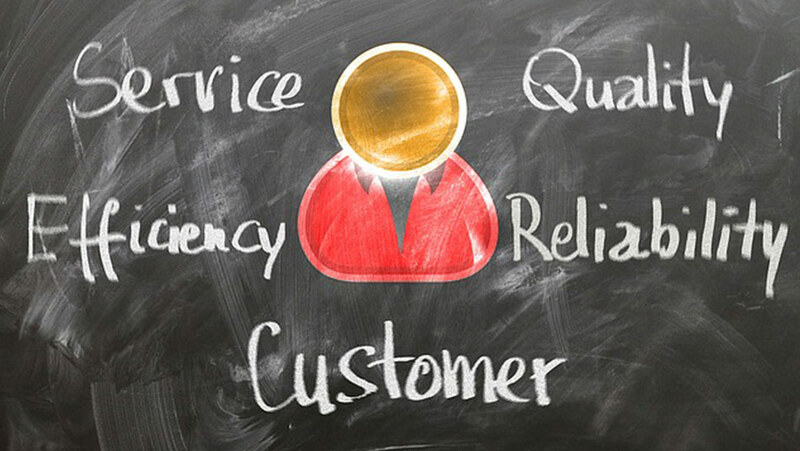 There are many more tips to boost the customer experience, but seven is a good luck number, so we’ll stop here. However, you shouldn’t stop thinking of ways you can make simple and affordable technology changes that will give your grocery locations a consumer experience edge. Remember, you can’t solve every technology problem with money. Often it’s more about creativity and the willingness to try simple new concepts. 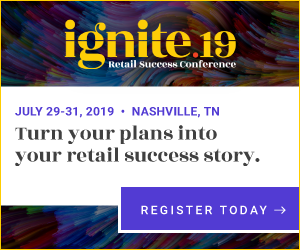 ECRS’ Success Navigator™ program excels at finding ways to make your point of sale system work for you and sustainably grow your grocery business.